It is 2707, but it seems more like 1917 – or at least some weird alternate history version of World War I in which advances in steam power has allowed mankind to travel to the nearby planets, but everyone still uses gas lamps. Earth is mired in an endless WWI-style trench war in which giant corporations, which have replaced nation states and have become Imperial powers in themselves, are bogged down in rain-soaked and mud-drenched battles on the plains of Europe. (The world is divided between four giant corporations running the show. A bit like, um, today. There is an American one, a British one, a German one and an Asian one.) It is during just such a battle that an ancient alien artifact buried deep beneath the earth is inadvertently unearthed and reactivated. The alien artifact is in fact a giant machine that somehow turns ordinary humans into crazed super-powered mutants with a single giant crab-like claw replacing their right arm. In fact, they look a bit like Mean Machine Angel from the Judge Dredd comics. In general Mutant Chronicles reminds one of the British 2000 AD comic book in the way it pastiches disparate visual cues – WWI comics and steampunk in this case. It is never really explained what exactly the automated alien machine and its exact purpose is; only that it turns people into mutants that soon start overrunning the human population and the former corporate enemies find that they have to set aside their differences and work together to fight this new mutual threat. But The Mutant Chronicles is somewhat on the over-serious side and any humorous touches are somewhat far in-between. Its deadpan religious overtones – a monk order somehow knows how to destroy the machine thanks to some handy ancient prophesies. What is it with modern science fiction movies and “prophesies” all the time? Personally we blame The Matrix. Or Dune. "Mutant Chronicles is The Dirty Dozen – but with murderous mutants!" But it doesn’t really matter what the machine is or what it does, because The Mutant Chronicles is a throwback to a Hollywood genre of movie that is no longer as popular as it used to be in the 1960s and 1970s, namely the WWII “commando” movie in which a group of elite soldiers is sent deep behind Nazi lines to blow something up real good. In this case an elite team consisting of former opponents is hastily assembled and sent to off blow up the alien machine real good. Take away the sci-fi trappings (and the over-the-top videogame gore violence and gore) and Mutant Chronicles is surprisingly old fashioned. Yup, Mutant Chronicles is The Dirty Dozen – but with murderous mutant creatures! Once one has accepted that this is in fact what Mutant Chronicles is, then it becomes a passable time-waster, something you’d prefer to catch late on cable one night or fit in as part of a DVD triple bill. In fact tt follows the WWII commando movie template so closely that if you channel surfed into it halfway you’d be forgiven for believing that that is exactly what you’re watching. Even the uniforms worn by the troops are made to resemble designs from that era . . .
Incidentally for a team consisting of former battlefield enemies there is surprisingly little squabbling and they soon gel as a coherent fighting unit. Maybe fighting for a huge corporation isn’t the same as fighting for a country or a belief. “We will die for you, WAL-MART,” simply doesn’t have the same ring to it. Actor Thomas Jane of Punisher and The Mist fame proves again that he makes for a more-than-suitable leading action man and that he should be a bigger star than he is. (Maybe audiences are put off by his “sissy” surname – who knows?) The other recognizable face in our cast of largely unknowns is of course Ron Perlman, fresh from Hellboy 2. The most interesting thing about Mutant Chronicles is its visual WWI steampunk look and feel which makes for a nice change from the more generic (but believable) Alien look and feel that is prevalent today. 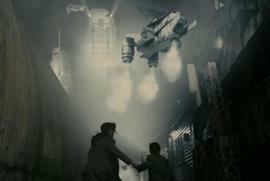 During the film’s opening sequences a lot of time and effort are spent on establishing this strange future. However once Mutant Chronicles shifts into its commando team crawling through darkened caves to blow something up real good mode you realize that this is about as interesting as the movie is going to get. Still, the low-budget sets and special effects are serviceable and the computer game-style action is okay, but somewhat on the average side of things.